It tastes just like the banana bread that can be bought in many of the nicer cafes around Sydney. I add an extra banana to what the recipe calls for, it makes it moister and richer in flavour. Don’t know about you but we always end up with mangy leftover bananas! Since I’ve purchased the Hummingbird Bakery Cookbook I actually get off on watching the last few bananas turn spotty and brown. I feel like Nigella, the Domestic Goddess herself, turning leftover waste into something magnificent! It is so easy to make, my almost 3-year-old son Jake, helps me measure all the ingredients and then I hand them over to him and he adds them in! Seriously easy and delicious. The entire loaf is gone by the next day! 200g peeled bananas, mashed (200g measures about two bananas and I throw in an extra one as I like it more moist). 1. Preheat the over to 170 degrees celsius. 2. Grease and line tin with baking paper. 3. Add the bananas and mix. 4. 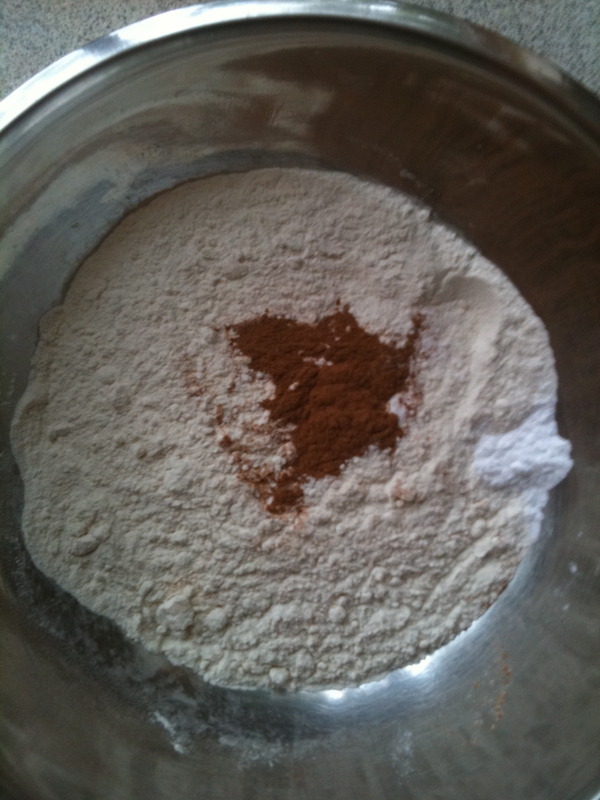 Add the flour, baking powder, bicarbonate soda, cinnamon and ginger (if you are using it) to the mixture. 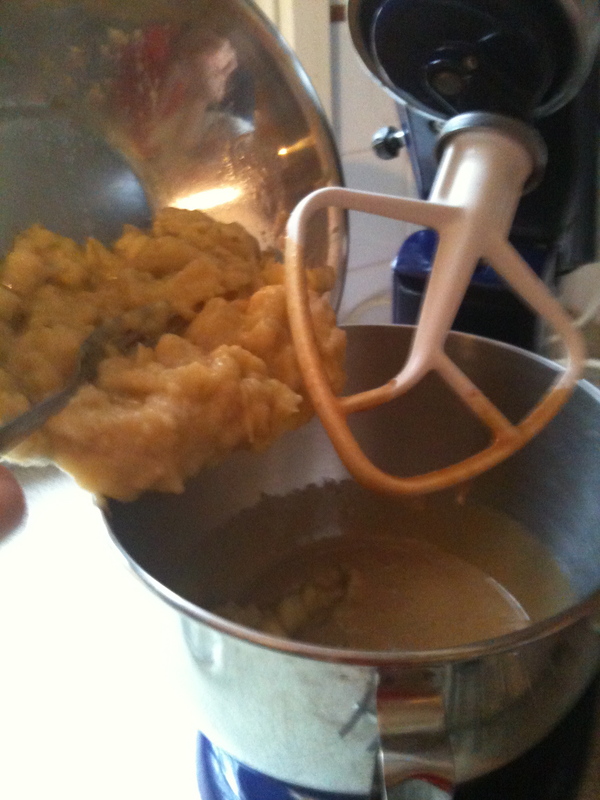 Mix it thoroughly until all the dry ingredients have been incorporated into the egg mixture. 5. Pour in the melted butter and beat until all the ingredients are well mixed. Pour the mixture into the prepared tin and smooth over with a knife. Bake for about 1 hour or until firm to the touch and a skewer inserted into the centre comes out clean. Leave the cake to cool slightly in the tin before turning out onto a wire cooling rack to cool completely. 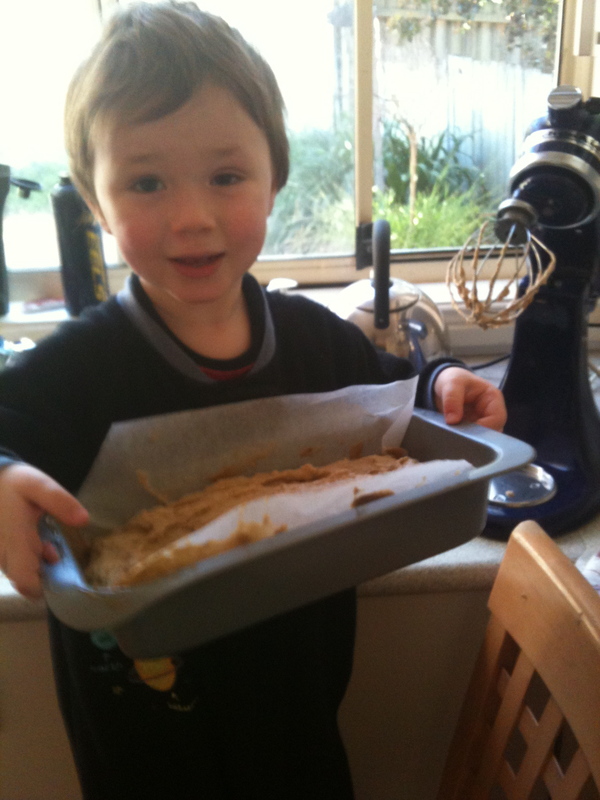 Tags: baking, banana, bread, cooking with kids, food, recipes | Permalink.